I had intended to do an overview of the season this week, but the stats are not posted yet, so I’ll try again next week. 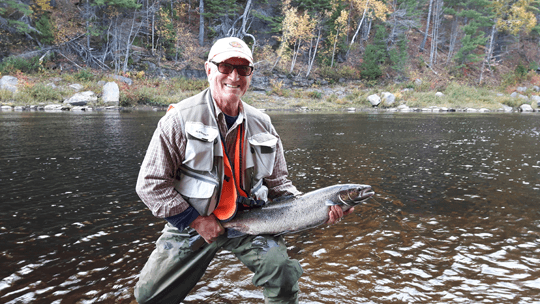 However, a general perception is that the Main Southwest Miramichi had the best angling this season. The Little Southwest was average at best, and the Northwest was poor, certainly in terms of low and warm water to try to fish. Having said this, the final numbers are still needed to gauge how the number of fish recorded relates to basic spawning requirements needed for the future of the species. There never seemed to be “big runs” but rather “spurts” of fish coming in sporadically. There are still fresh fish being recorded at the counting stations. The rivers that are still open for salmon are the Bartibog, Burnt Church and Tabusintac Rivers which close October 29. Striped bass can still be fished with the final retention period now running to October 31, during which time each person is allowed to keep one fish per day, with a possession limit of one between 50-65 centimeters. The length is measured in a straight line from the tip of the nose to the tip of the tail (total length). Tom Tonge from Quispamsis with a nice hen caught on the Wangatang Pool at Milletts on the Cains on the last day of the season. Jim Laws of Miramichi Hunting and Fishing in Newcastle, Miramichi said the striped bass are continuing to move into the Miramichi area. Angling usually takes place on the falling tide. Evening fishing is also productive. Most are using circle hooks with bait, but some are taking the lures and rubber fish. Laws had heard of one 30-pounder caught. So get out and enjoy the final weeks of “on the water”. Tom Bishop from Saint John with a nice henwith a little help from TK Tonge caught on the Wangatang Pool at Milletts on the Cains on the last day of the season. Don’t forget to show your support for our sponsors, because without them, this column would not be possible. A SPECIAL THANKS to all who made contributions last season. If you would like to sponsor this column, give us a call at (506) 352-7668 or email support@mightycommunity.com. Consider the incredible gift, the privilege we have to angle, land and release these magnificent Atlantic salmon….with the season having drawn to a close in many places, it’s enjoyable to sit quietly fireside and reflect on the journey yet to be undertaken by those that we’ve had to hand this past season, it’s not difficult in a thought filled moment be held in amazement of them, appreciating that which they must endure to accomplish the remainder of their long journey, the return, for which we have held them up for but a brief moment outside of its due course, it’s not at all difficult to envision the obstacles yet ahead and in that once again contemplate their great need for terrific stealth, strength and speed, the very things that draw us time and again to engage them with the fly, for them it is means to find their way back to their aquatic inner sanctum, home, to fulfill the task that gives all of us who consider them and wish them well, hope, for those wonderful riverside moments yet to be in our own days ahead where perhaps by chance one day you will hold the very offspring of that last beautiful fish that left your hands, the one you watched powerfully swim away into the depths of its native element on the very last day of the season somewhere along that river, not so long ago. A study undertaken by Gardner-Pinfold Consultants compares the strength of aquaculture regulations in Canada, Maine, and Norway to an international standard. The result; no jurisdiction is taking all the necessary steps to protect wild Atlantic salmon from the affects of the industry. Check out ASF’s press release, as well as the study and backgrounders, all available as small pdf documents. Also on Tuesday, Atlantic salmon were “air-lifted” into the Upper Salmon River. In NB much of the salmon season is now finished, but it is still open on beautiful rivers like the Bartibog. A few choice photos of salmon being released. 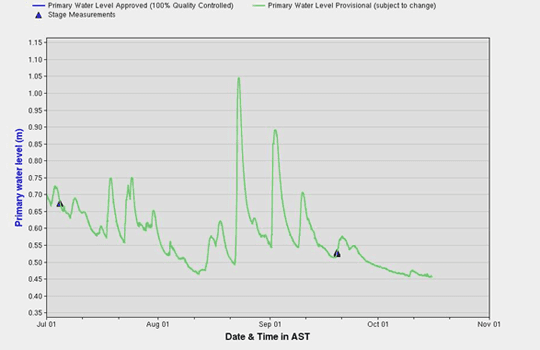 Check out the latest – including a description of the lift of Atlantic salmon into the Upper Salmon River. For the fourth time this year (plus two times in 2015) virulent strains of ISA have been found in NB salmon aquaculture. It is transmitted through the water and can kill wild Atlantic salmon. Other species, including herring, can be affected and die as a result of the virus. A cargo ship from the Russian enclave of Kaliningrad slammed into a salmonid fish farm in Denmark, with unknown consequences for nearby salmon and trout rivers. Your Chance to Own and Play a Legendary Spector Bass Guitar – thanks to ASF! Anyone wishing to report suspicious fishing activity anonymously is asked to contact the nearest Fisheries and Oceans Canada office or to call Crime Stoppers at 1-800-222-8477. 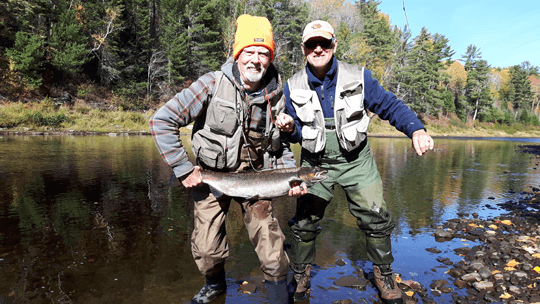 Want to receive the Miramichi Fishing Report by email? Click here to subscribe now! This is a syndicated post. You can view the original post here: Miramichi Fishing Report for Week of October 20, 2016.